I am a “take my lunch to work” gal. I can’t justify spending extra money on lunch when I typically have more than enough in my fridge or pantry to whip something up that will keep me going through the afternoon. Having said that, I would much rather make something that takes 5 minutes as opposed to 20. 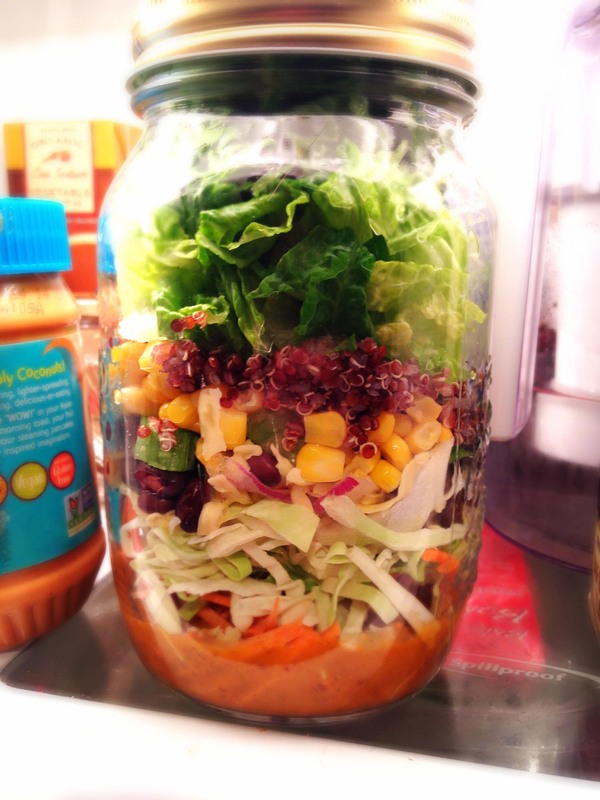 Jar salads are one of my favorite go-to lunch meals and make frequent appearances during the week. Quick and easy, filling and colorful, with a dressing that is ready to go, makes it that much easier to get my greens in during the day. Not only that, they are fun to eat. Maybe it’s something about the layers, the dressing that spills out over everything or the fact that they are in a pretty glass jar that makes the difference. Who knows. Whatever the reason they always seem to taste extra delicious to me. – Bottom Layer: if going with a dressing, this is the first thing that should go in the jar whether you choose something creamy or a vinaigrette. The key with salad jars is to make sure they STAY upright. If so, the bottom layer will give you no issue whatsoever. If the jar does tip over your dressing may soak into some of your greens making them wilt after all day in the fridge. Not ideal. – Second Layer: this is where I place my crunchy things: aka carrots, onions, cucumbers, celery, cabbages or apple slices for example. Remember, these ingredients will essentially be taking a bath in your dressing so you want things that will stand up to the dressing without falling apart. The ingredients I just listed do fine. Sometimes if using a vinagrette they may even acquire a slight pickled taste too (say sliced onions or cucumbers for example) but I love it! You want enough of the crunchy things to create a distinct level between the dressing and the third layer. – Third Layer: this is where I add softer items or items that without all the crunchy things below may sink to the bottom of the jar. So in goes any cheeses, grains (farro, quinoa, wild rice, rice pasta), beans (black, kidney, white, garbanzo), corn, egg slices, leftover cooked tuna or chicken…things like that. – Fourth Layer: the fourth and final layer is your greens! Feel free to use whatever types of greens you like – spinach, arugula, mixed greens, romaine, baby lettuces or even iceberg for those who like things super crunchy. Because the greens are on the highest level (again, as long as no tipping is involved) they will stay crisp and perfectly fresh guaranteed every time. That’s it! Super simple. Come lunch time, it’s fun time! Simply get out a big bowl, open your jar, flip over and dump out everything into the bowl. As all the ingredients spill out the dressing will cover everything. Give it a little mix and lunch is served! 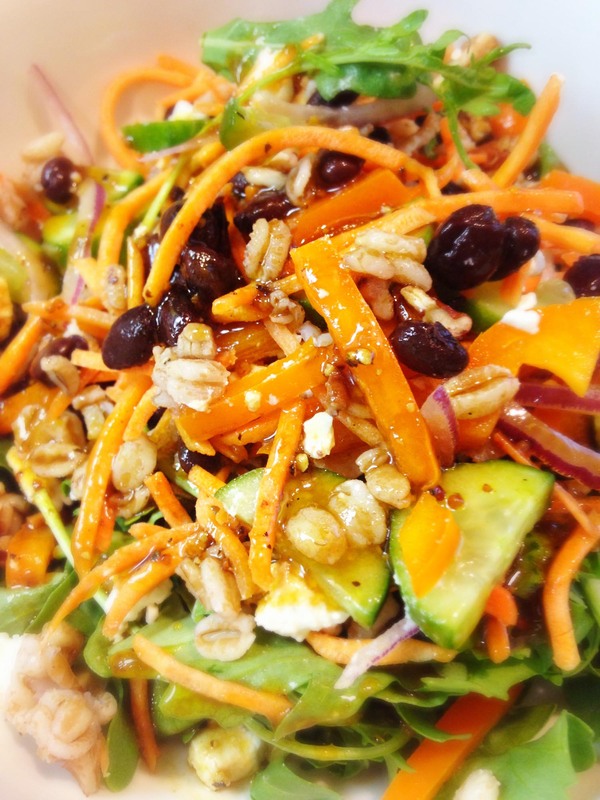 The great thing about these salads is that you can get really creative. Think of all the combinations you can come up with. 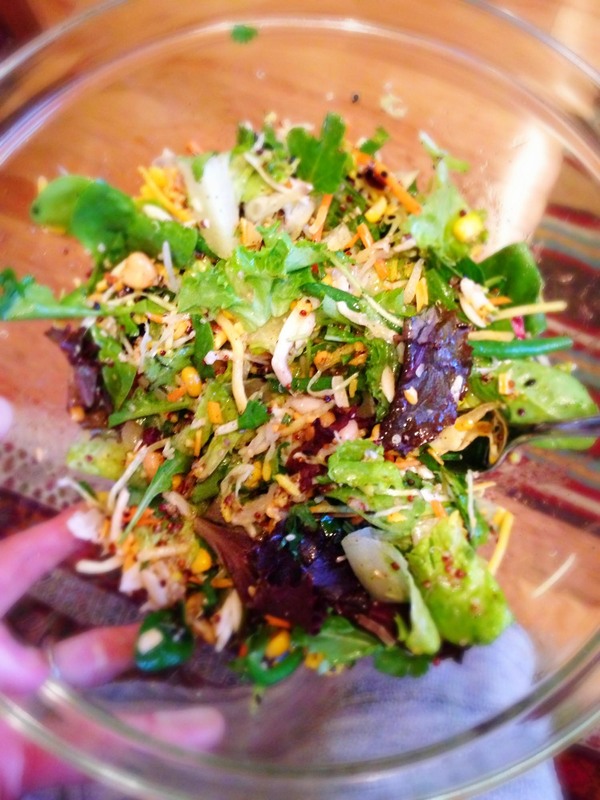 If you’d like to know how I typically make my homemade vinaigrette, go here! So many different combinations. Seriously. Go crazy. Have fun and enjoy your salads in a jar! Sick of going to Subway for lunch!?! Awesome way to make packing easy!